This morning we set out to the local Fisherman's Days down at the harbour. What could be a better dose of Maritime Fun than the promise of a boat parade, a shell shucking contest, fiddle music, local displays and of course a bouncy castle for the kids? Until we got there and it started raining shortly before the opening ceremonies. We all huddled under the tents. Feeling brave my family ventured out to look at the boats and what was still open of the displays. My husband and I thought we would warm up a bit with a bowl of chowder from one of local vendors, except that it wasn't yet ready. We went back, it still wasn't ready. After the third time going back and starting to realize that the drizzle was not going to let up and that the wind was only getting stronger, we set ourselves back for home. But now we both really wanted a bowl of chowder. I remembered my dear friend Luan serving us the best seafood chowder at her husband's birthday a couple of years back and tried my best to find it. This recipe jumped out at me in my search and by looking at the ingredients I thought it would be very good. It was, it was very good indeed. This recipe is an award winning recipe from PEI's Chef Jeff McCourt. 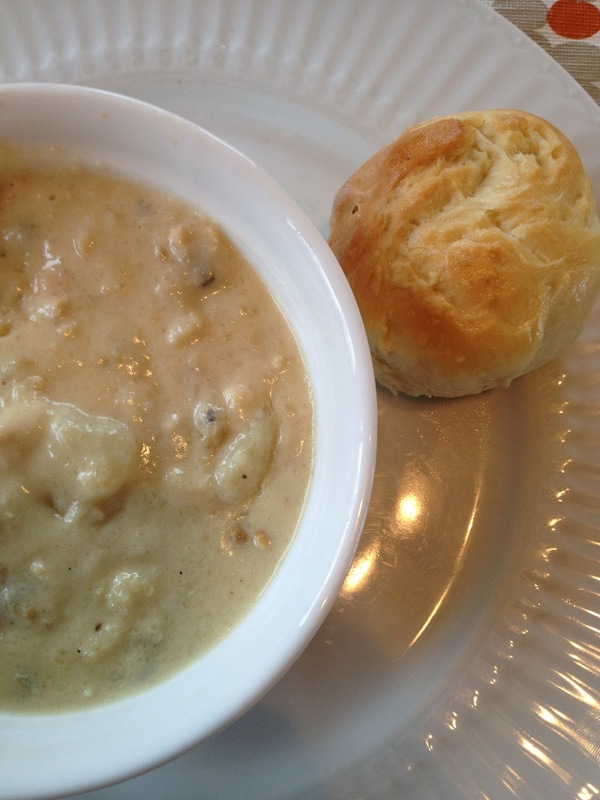 It took first prize in the PEI International Chowder Championship in 2003. It is a little time consuming to make, but very much worth the effort. Melt butter in a large pot over medium heat, add onions and sauté until translucent. Stir in garlic and continue to sauté until onions are golden brown. Add grated potato, vermouth, milk and cream. Cook over medium heat, stirring often to prevent scorching, until potato is cooked, about 20 minutes. In a blender, purée chowder base in batches, then return to chowder pot and season with salt and pepper. Cook whatever shellfish you want to add to the chowder, retaining all liquid from the cooking process. Shuck and set seafood aside. Add cooking liquid to the chowder base. Add diced, cooked potato for texture. Add seafood, and check for seasoning one last time. Finish with chopped chives. Makes 8 to 10 servings. *I paired this with some homemade dinner rolls - delicious!